The popular press has been abuzz with articles on ADHD, with many suggesting that the diagnosis is much overused and that medication treatment is basically a way that affluent parents give their children an academic advantage. In the midst of all this controversy comes a recent and interesting study in the journal Psychiatric Methods, which compared the rates of stimulant treatment in children and adults across regions, states and counties. Using an IMS Health database, a total of 24.1 million prescriptions were analyzed, all issued in 2008 and representing over three-quarters of all U.S. pharmacies. Prevalence rates were calculated using weighted statistics based on U.S. census numbers and regression models were applied to examine potential factors that might be related to the variable rates between different areas. Of note, the authors looked at sustained stimulant treatment and did not count prescriptions that were filled only briefly. Overall, a total of 2.5% of children were being treated with stimulant medications nationally with the rate being higher in boys (3.5%) than girls (1.5%). In addition, 0.7% of adults over age 17 were also receiving these medications. For children, the lowest stimulant rate was in Alaska (0.4%) while the highest was in Delaware (5.1%). Vermont came in at 34th at about 2%, while neighboring New Hampshire was 14th which was right after Massachusetts. Regional differences (South, Midwest) were smaller than between neighboring states and counties. About one-third of the treatment came from psychiatrists. Higher rates of treatment was related in children to an increased supply of pediatricians, lower socioeconomic status of the population, and more funding for special education. In the discussion, the authors perspective was mainly about access to treatment. They noted that the prevalence of ADHD is generally cited as between 5-10% which would suggest a large number of children not being diagnosed and treated, especially in particular states and counties. However, the authors also acknowledged that their data could not directly address the question of under or over-diagnosis. The finding of stimulants generally being related to families with lower socioeconomic status, however, does suggest that they are not being used simply as a study drug for well-to-do kids. It is also important to note that nonstimulant medications such as atomoxetine as well as nonpharmacological treatment were not included in these analyses. What to make of Vermont as being towards the bottom of the pack? 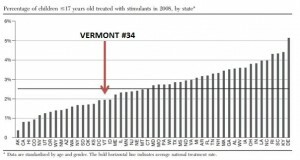 I must admit that this result was a bit surprising to me and does not quite square up with data from the Department of Vermont Health Access which found much higher rates, at least among kids with Medicaid. Furthermore, whether this 2% rate found in this study reflects good and careful prescribing, statewide under-recognition of ADHD, or a mixture of both is difficult to say. There are wide fluctuations even within our small state related to the density of primary care physicians. At least in rural areas where access to pediatric care is more difficult, these data would suggest that many struggling children have yet to have their ADHD symptoms diagnosed and treated. McDonald DC, Jalbert SK. 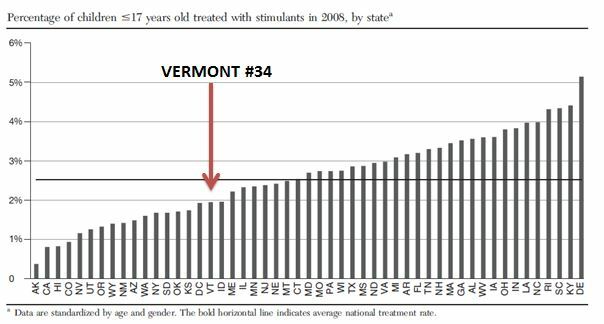 Geographic Variation and Disparity in Stimulant Treatment of Adults and Children in the United States in 2008. Psych Services 2013;64(11):1079-1086. This entry was posted on Sunday, January 5th, 2014 at 10:34 pm and is filed under ADHD, Medications. You can follow any responses to this entry through the RSS 2.0 feed. You can leave a response, or trackback from your own site.